product was exactly as described. it took over 1 month but I love the bracelet. Cute ! Shipped fast. The face of the bracelet Seems well made just seems a little small. Very small. More suitable for a child. 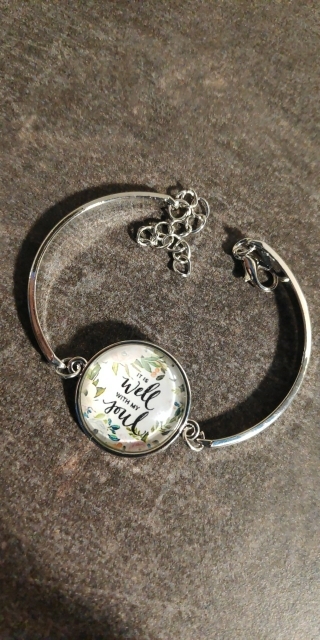 text is very small on the actual bracelet and so hard to read. Beautiful, same as the photos! Came fast, 17 days! perfect hough only for a slim hand. These bracelets are very cute and I am impressed with the quality. They are hard to do up by yourself because of the solid pieces that go around the wrist, but they are cute on. Also as other reviews stated, the print is small. I have good eyesight, but the more words you get crammed in that small space, I have to get out the magnifying glass to read. So if you want to read it, choose a style with few words! shipment very fast. product quality also good. So pretty! Arrived in less than 2 weeks.